The Roanoke Region is fortunate to have quick access to numerous state parks, each with their own distinctive features and offerings. Find your adventure in a state park; it’s likely just a short drive away. State parks include everything from lakes to trails to boat ramps and other access points. Some also have campgrounds and amenities to stay for a while. Whether you are new to outdoor adventure or a rugged outdoorsman, a state park can be a great place to take a break and absorb the scenery. Located on the 4,500-acre, 21-mile long Claytor Lake in the New River Valley, Claytor Lake State Park offers a wide variety of activities for water and land enthusiasts. Easily accessible from Interstate 81, the park offers swimming, camping, cabins, lodges, a meeting facility, nature and history programs, miles of hiking trails, and a visitor center. Once owned by Thomas Jefferson and listed on the National Register of Historic Places, the 215-foot tall Natural Bridge is a limestone gorge carved out by Cedar Creek. The newest Virginia State Park is more than just the bridge. 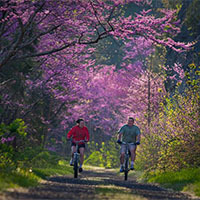 Beautiful forests, open, rolling meadows showcase the area’s karst terrain, and vistas of surrounding mountains and the James River valley display nature’s splendor. Access these via 6 miles of hiking trails, including the accessible Cedar Creek Trail that leads from the bridge to the Monacan Indian Village and Lace Falls with its 30-foot cascade. Living history programs connect you to the past and cover how people once used the area’s resources for survival and inspiration. Start at the Rockbridge Center where you will find exhibits and a gift shop. Admission per person is $6 for ages 6-12 and $8 for those 13 and older. Learn about the Virginia Conservation Legacy Fund’s facilities and activities here as well. The trail’s gentle slope makes it great for visitors of all ages to hike, bike and ride horseback. The park’s Foster Falls area offers guided horseback trips; canoe and bike rentals; boat launches; gift shops; and a horse arena. Fishing is popular, and primitive campsites dot the trail. There are access points to the trail at Allisonia, Chestnut Yard, Cliffview, Dannelly Park (near Galax), Draper, Dora Junction (near Pulaski), Foster Falls, Fries, Galax, Gambetta, Hiwassee and Ivanhoe. Horse trailer parking is available at Allisonia, Austinville, Cliffview, Dora Junction, Draper, Fries, Ivanhoe and the Mark E. Hufeisen Horse Complex near Foster Falls arena. Smith Mountain Lake State Park is situated on the second largest body of freshwater in the state and is not just for water enthusiasts. In addition to a full range of water-related activities, including swimming, fishing, and boating, the park offers miles of hiking trails, cabins, camping, picnicking, a visitor center, and interpretive programs. 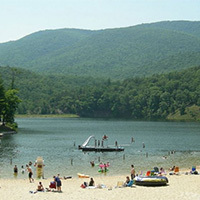 The 1,148 acre park is on the north shore of Smith Mountain Lake in Bedford County.